January 21, 2019 By Ned Christiansen & filed under All Articles, Rifles & Carbines, Weapons. Customized Howa rifle. Precision Rifle Series matches ask much of a shooter and his rig. 1,500 yard and longer shots are not unusual. Howa may not be a household name to Americans, but the brand has long been known for quality and strength in the form of Weatherby Vanguard rifles. That’s right: Many of the elegant rifles offered by Weatherby in their smokin’ hot calibers have, for decades, been built on Howa actions. Howa does not offer complete rifles to the U.S. market, only barreled actions. To get a Howa rifle that is not a Weatherby, there is only one place to go: Legacy Sports, the sole importer of Howa barreled actions. Legacy sells dealer direct and through several distributors, and completes some barreled actions into rifles by fitting them into stocks. 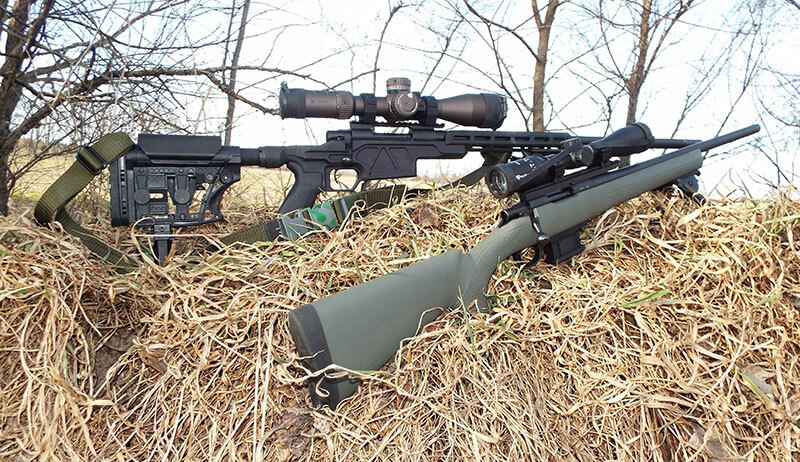 Two examples of these complete rifles were tested: the Mini-Action in 6.5 Grendel and the Howa Chassis Rifle (HCR) in 6.5 Creedmoor. Howa barrels are hammer forged. This barrel-making process leaves little in the way of tool marks and is said to give longer barrel life. I bore-scoped both 1:8 twist, free-floating barrels before firing a shot and found fine-looking surfaces on the inside. Unfired barrels often have tiny burrs wiped into the start of the rifling by the chamber reamer, but I saw none in the Howas. The three-position safety is a Howa standard. Its middle position allows the bolt to be retracted with the safety on, while the farthest back “safe” position locks the bolt. Both bolts ran smoothly with no binding. Author bangs steel at 750 yards. 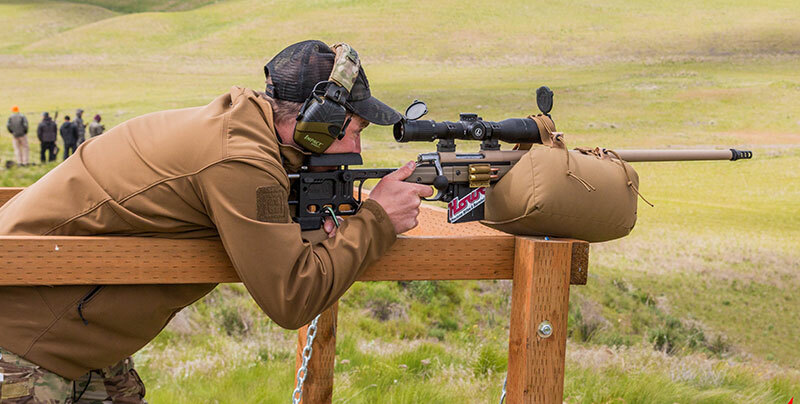 Howa HCR’s target market is competitions such as the Precision Rifle Series. Finding enough distance to stretch the legs of a true long-range rig is not always easy. Howa’s HACT trigger gives the shooter a light, crisp release while maintaining a safe system not intended to be user-adjustable. I try not to be dependent upon feathery triggers in anything. My two examples gave what I consider to be perfectly adequate, crisp 3.25-pound pulls with a very light first stage. For those who demand something different, aftermarket triggers are available. Most bolt-action rifle manufacturers make long and short versions of a particular model to accommodate different calibers. For example, if you are shooting .308, why have a rifle action long enough to accommodate .338 Lapua Magnum, which is about an inch longer? Better to have an action sized to the caliber we are shooting, for several reasons: economy of motion, cost, weight, and size. 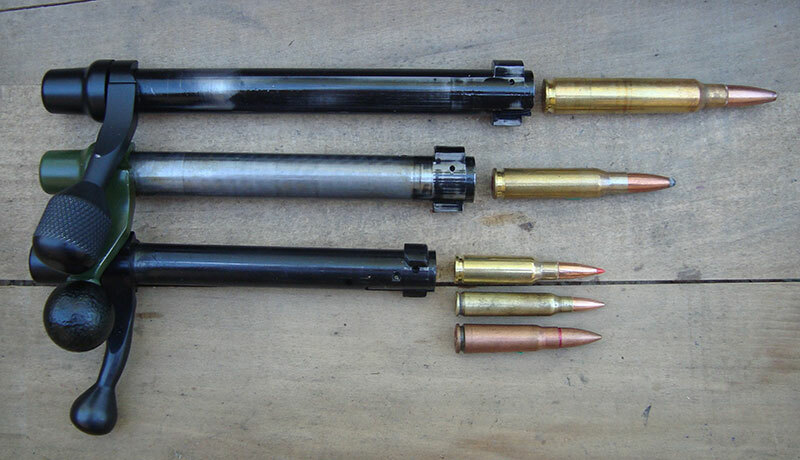 Most companies offer a short action for, e.g., .308 and smaller cartridges such as .223, which is about 5/8 inch shorter than .308, and a long action for calibers like .30-06 and the Magnums. A standard short action is longer than necessary for .223, so why hasn’t anyone … wait, someone has! Recently, Howa introduced a Mini-Action to their line of barreled actions. It is scaled down especially for the .223 and other popular calibers of about the same length, such as the 6.5 Grendel, .204 Ruger, .222, and 7.62x39mm. The Mini-Action’s compactness is immediately evident, especially in the presence of other rifles. These rifles are all under six pounds, have 20-inch barrels, and use molded detachable magazines of five rounds. I tested the 6.5 Grendel version. Mini-Action’s short bolt (bottom) offers shorter, faster bolt stroke. Combined with resulting smaller action, a handy and compact rifle results. Remington long- and short-action bolts on top. The Mini-Action’s controls are in the expected places except for the magazine release, which is in front of the magazine, not behind it, as is more customary. This proved a little irritating. Grasping the rifle by the forend just forward of the magazine, as one tends to do since it is the balance point, care must be taken to avoid dropping the magazine. The magazine, mag release, and the entire trigger guard/mag well unit are injection-molded plastic. 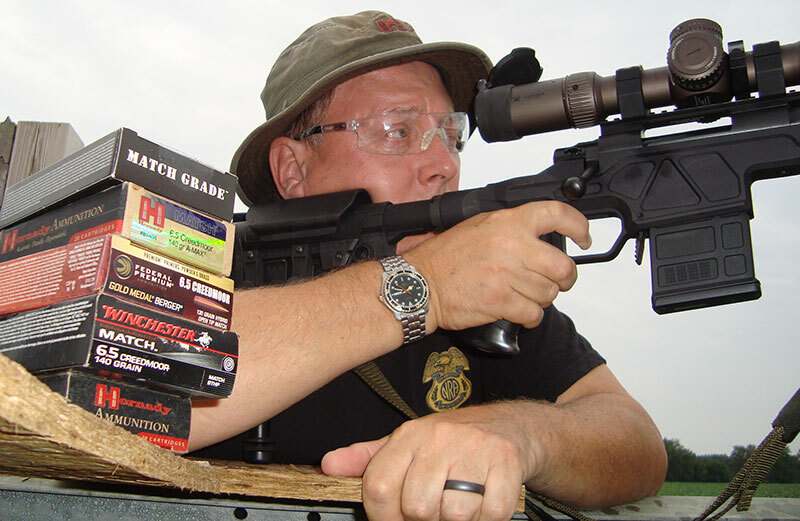 Readers will doubtless wonder if, especially in the .223 version, AR-15 magazines can be used. The answer is “no,” and such a conversion would not be easy. The Mini-Action can be had as a package that includes the Nikko-Sterling Panamax scope, rings, and bases, ready to mount. This 3-9X scope with mil-dot reticle is not for the optics elitist or high-end competitor, but no one is pretending otherwise. For a scope retailing at under $150, it gets the job done well enough and would be an economical way for a shooter to become familiar with the mil-dot system before laying down 10 or 20 times the price for a higher-end scope. At 500 yards, the Panamax’s low price did not prevent me from getting 1¼-inch and better groups at 100 yards, using ammo from Hornady, Federal, and Highland Lakes. The handiness of the Howa Mini-Action is its most attractive aspect. For its size and weight (seven pounds scoped), it offers range, accuracy, and punch that are suitable for many kinds of hunting and range fun, at an as-tested, scoped suggested retail price of $815.00. At .264 diameter, 6.5 caliber bullets occupy a seemingly mystical ballistic sweet spot with regard to resisting wind and gravity. A pair of 6.5 rifles from Howa—the Mini-Action in 6.5 Grendel and the HCR in 6.5 Creedmoor—are reasonably priced and eminently viable platforms for these cartridges. The 6.5 Creedmoor cartridge’s ascendancy and dominance in long-range competition results from its ballistic superiority in terms of wind resistance and reduced drop. It surpasses .308 and can hang with .300 Winchester Magnum in these areas. Some other cartridges may be marginally or theoretically superior, but the 6.5 Creedmoor’s popularity has brought factory ammo selection options up and prices down. The HCR’s aluminum chassis stock is manufactured by Accurate-Mag. It has a slender and efficient look and feel, and uses any AR-15 pistol grip and buffer tube, giving myriad furniture options. I found factory set-up quite acceptable: an Ergo pistol grip and an adjustable stock slider by Luth-AR. This stock offers a lot of adjustability to several aspects of shooter fit. Length of pull, once adjusted, locks to eliminate wobble. One detachable five-round steel magazine comes with the HCR. Ten-rounders are also available. These are interchangeable with Accuracy International magazines. Five- and ten-round magazines from Accurate Mag, AI, and Magpul were tested with no issues other than the Magpul ten-rounder didn’t drop free when full. With six rounds or fewer, it did. HCR controls are identical to the Mini-Action’s with the exception of the magazine release being located behind the magazine. I used a Picatinny scope base made for Legacy Sports by EGW in Quakertown, Pennsylvania. It has the requisite 20 minutes-of-angle downslope to ensure a scope can be dialed enough in elevation for long-range targets. Scope and rings are Vortex. Vortex Gen II Razor 3-18X scope with MOA reticle is big, expensive, and feature-laden for making long shots with more science and less guesswork. Nikko-Stirling 3-9X Panamax scope is inexpensive but gets it done and is a good value for the shooter wanting to learn the way of the mil-dot. The Vortex Gen II Razor 3-18X is narrowly focused on precision long-range shooting and virtually runneth over with features. With a 34mm body, large locking turrets offering quick adjustments, and side focus and illumination settings, it is neither small nor light. 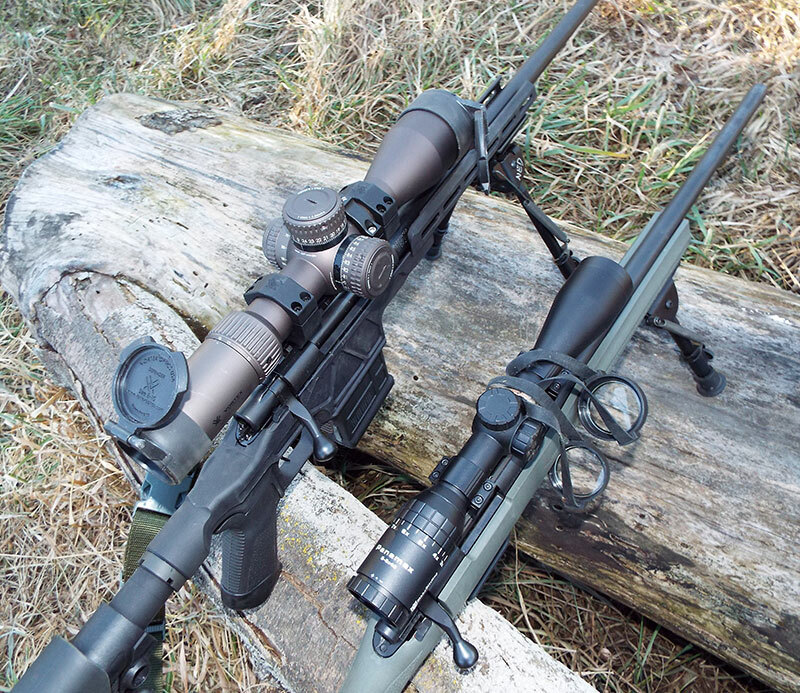 For the three-days-a-year deer hunter, it is overcomplicated, but for the shooter wanting a scope that reduces long-shot guess work, the Razor’s capabilities will be welcome. Image quality is superb. The Razor’s first focal plane (FFP) reticle is offered in two versions: the MRAD reticle or, as tested, MOA. FFP reticles offer a range-finding advantage to the user willing to learn the system. Because the reticle grows and shrinks with the image as the shooter adjusts the magnification level, ranging can be accomplished at any power setting: If a target known to be 40 inches tall fits inside a 4 MOA reticle division, it is at 1,000 yards. With traditional second-focal-plane scopes, where the reticle does not change with the power setting, ranging can only be accomplished at a certain magnification. On some very costly carbine scopes, I have perceived FFP reticles as a disadvantage. The reticle is small at 1X, where I want it large for close-up, fast shooting. At the 4X or 6X magnification settings I would use for attempting precision shots at distance, circle-type reticles are much too big for pin-point targeting. But on a scope of this magnification range and reticle type, things are different. Although the reticle does get hard to read down at 3X, I doubt this scope will see much use below 6X, where it becomes less of a problem. At 18X, the reticle does not get too thick for precise targeting. 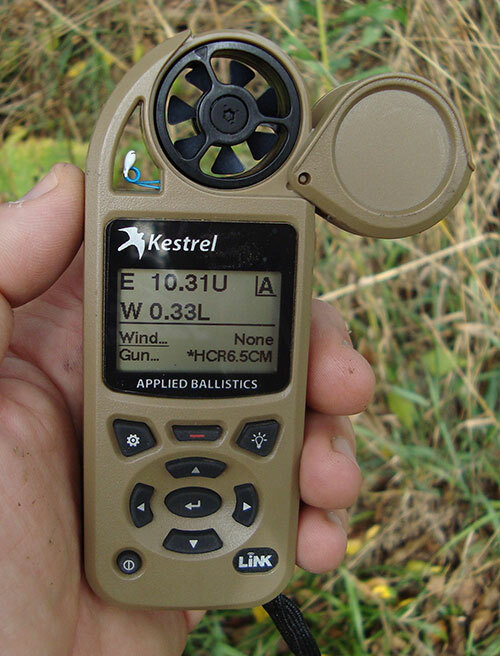 Solution in hand: Kestrel reads wind and atmospherics, runs them and other factors with Applied Ballistics program, filters inputted caliber and firearm specifics through them, and provides reliable firing solution. First-round hit probability is greatly improved over seat-of-the-pants method. I had one of the first Kestrels, which was fairly large and told wind speed only. That was about 1995. I recently got a major update on Kestrels when I had occasion to observe some impressive young alpha males complete a lengthy sniper course. The way of the Kestrel is easy enough to learn for anyone with a modicum of gizmo aptitude. At over $700, buying one is no breeze, but if long-range zen is your goal, it is practically a must-have. 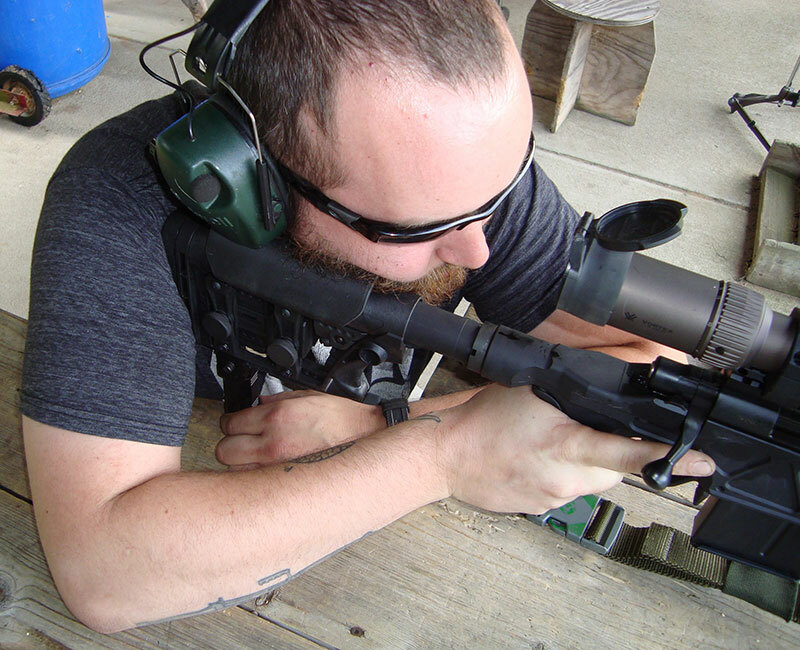 Will S. fine-adjusts CTK Precision rear monopod, easing reticle into perfect alignment with target. Not so long ago, Harris was the only bipod game in town. They have long been and still are in wide use in every type of rifle shooting. They’ve been directly copied. I have several Harris bipods and, I confess, one knockoff. On my Accuracy International-stocked Remington, I felt a Parker-Hale bipod would be apropos. At twice the weight and cost, and with less utility, I’ll take a Harris over it any time. But for the HCR, I tried something different. The Mystic Precision MPOD is perhaps not the most tactical or practical for some applications, but with its extra-wide stance, it brings “steady” to a new level. The legs do not fold, but the unit detaches easily enough for transport and storage. Fine tuning-out of any canting once the legs are individually adjusted is done by loosening a lever, leveling, and retightening. In place of my usual sandbag rear support, I used a CTK Precision monopod mounted to the Picatinny rail manufactured into the Luth-AR stock’s bottom. Getting close to on-target is facilitated by coarse, cam-locked adjustments to monopod height. Precisely easing the reticle into final, perfect alignment is then done via a finely threaded adjustment ring. The Mystic/CTK combo was a big help in getting solid, steady sight pictures and started to feel like cheating. The Tactical Intervention Specialists sling I used is, in my opinion, under-recognized. It has an arm cuff built into it for those who appreciate the importance of the sling in some positions. The cuff is quick to use and features a Fastex buckle as a quick way out of it. Length is quick-adjustable with a tug on the end. 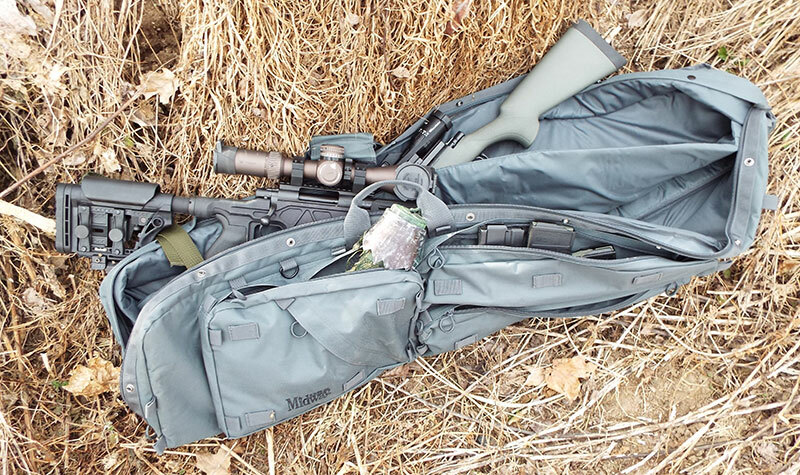 Midway Sniper Drag Bag is sturdy, spacious, and capable. To protect and transport both rifles, I shopped online at Midway USA, a reliable source for almost everything shooting-related. They are steadily feeding in several of their own, Midway-branded items to the nearly 1,000 product lines they carry. Their new Sniper Drag Bag case is available in several colors and camo patterns. This case represents a stellar value for all the well-considered features and protection it offers, including compartments galore and stowable backpack-type straps. At 50 inches, it is not compact, and a 56-inch length is optional. It has a divider and holds both rifles, seven magazines, log books, targets and stapler, cleaning gear, and even my spotting scope with space to spare. It is voluminous and stout. No company is making “fodder-grade” ammunition in 6.5 CM. It’s all premium. In 500-plus rounds of firing five- and ten-shot groups and banging steel, not every group was at or under 1 MOA. But as I learned the rifle’s preferences, it got easier. Point of impact changed less than 1 MOA from load to load, even though bullet weights varied from 120 to 140 grains. 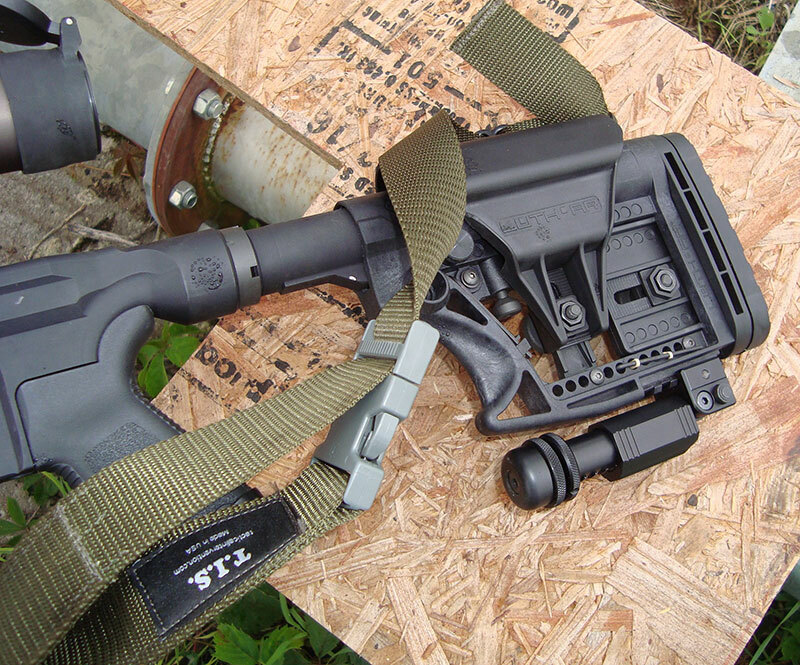 Luth-AR stock offers a lot of adjustability to several aspects of shooter fit. Once adjusted, length of pull locks to eliminate wobble. My maximum available range of 750 yards was hardly a stretching of the legs for this long-range rig. On a breezy day, I managed a ten-shot group on steel 10 inches high and 18 inches wide. The oblong pattern exposed my need to get better at shooting in the wind. Many competitors continue to use .308, but 6.5 Creedmoor offers demonstrable advantages. At $1,265.00 retail, the HCR, with its sub-MOA guarantee and lifetime warranty, is a reasonably priced way to start.